After the free night accommodation at the Kimberley Klub Backpackers in Broome I headed down south to wherever I might end up. With no places to stay and no money from here to Perth I just took off, hoping things would work out fine! I had toast with chocolate paste breakfast at the hostel. One very friendly Italian backpacking lady shared her tiramisu with me. Do you know how delicious that is in the morning!? 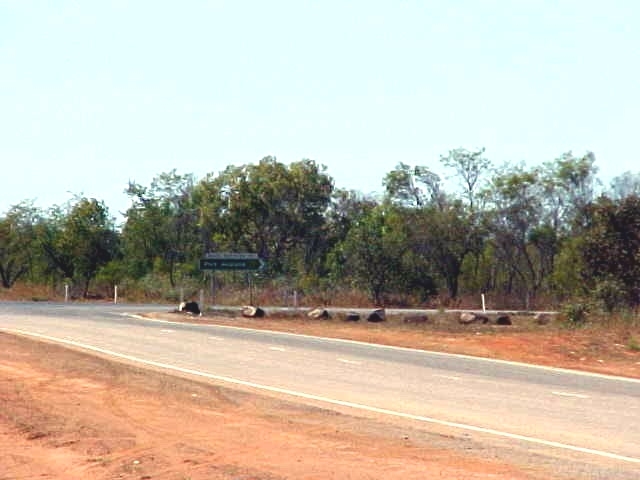 The road from Broome to the nearest reasonable town down south is only some 600 metres and I'd be hitchhiking. 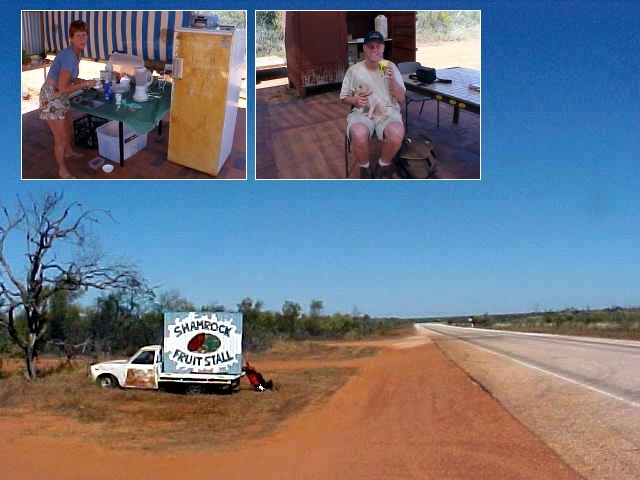 I thanked the staff at the hostel and walked to the main road out of Broome and started hitchhiking. 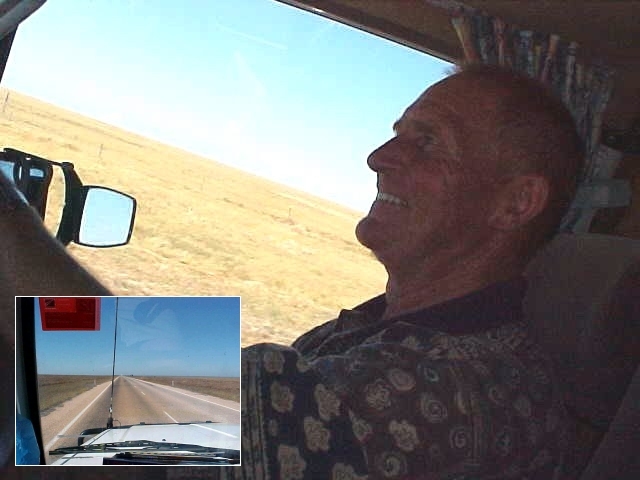 An old couple with a caravan behind their car took me up, but only to the t crossing where the highway down south starts. That was only 30 kilometres. I met up with another hitchhiker that was standing in front of one of the signs, who introduced himself as Brandon. He was on his way to Darwin (!) and had been standing at this spot since 7am and he had slept in a swag in the bush. Scratched on a street sign: "There comes a car, there goes a car." A great quote by some great travellers! For me it was around 11am now and it did not take very long when the first call that appeared on the horizon was going south and offered me a ride. It was with Jim, who could only take me another 100km, as he had to go to the diminutive town Port Smith (population: probably some 24). Jim worked in the pearl industry and was on his way to visit some friends. After an hour he dropped me off on the Highway, almost in the middle of nowhere, but fortunately there was a fruit stall! Along a stretch of 600 km road some great person had the idea to fulfil a perfect marketing opportunity. At the Shamrock fruit stall I met up with Irene who was selling paprika, corn, beans, watermelons, rockmelons and some other fruit vegetables from the local farm behind the stall. She was quite surprised when I suddenly showed up. Without a car. However I was surprised about the existence of a fruit stall on this empty highway. During my ride in the car with Jim I had not exactly seen any other car. I told her how I ended up there and she helped me out with a complimentary coffee. Then Irene � she must have been looking forward to some form of conversation out here � asked a bit further and she soon found out about my special way of travelling� the world. "Oh! Let me make you a special Shamrock Mango Smoothie and show you some Aussie hospitality!" she said and immediately prepared this milk shake with ice and milk from the fridge and mixed it all up with a blender. Irene just started this job only 3 days ago and was quite happy with it. She always had a job involving the contact with people and when she was in Broome, the employment agency came up with this spot at the fruit stall. "It pays good," she says. "You meet some great people and you are another example and the people I work for a very friendly. I work 'till 3pm and then I go to the farm to prepare tea [dinner] for the workers on the farm." She guaranteed me I wouldn't be stuck here, today there was roast chicken on the menu tonight. When the farmer came around with a new load of fruits and vegetables, Irene told him about her special guest and introduced me with Dan. Dan runs the 3 square kilometres farm land (the Shamrock homestead) behind the fruit stall and was willing to show this 'visiting journalist' his farm. Before I knew he drove me around and showed me his (some of his eighty) patches of land with watermelons and rockmelons, explained me his way of farming (did you know a watermelon grows from nothing to this fruit lump of red fruit meat in only seven weeks? 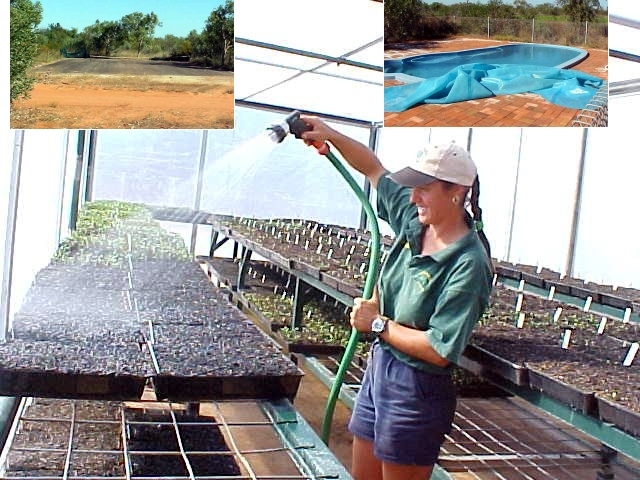 ), how the underground irrigation works (it's underground to feed the roots of plants and that way it won't create an outburst of weed plants). He showed me the living quarters of his employers. In the summer time lots of backpackers work here some 8 hours a day and earn $100 � however it is in 40 degrees temperatures. But that goes together with drinking breaks every 20 minutes and a warm dinner at lunchtime. And Dan invited me to have lunch too! I joined in with the few workers (it was dry season and not that busy now) and enjoyed a couple of hotdogs! A small hour later, Dan dropped me on the road again and wished me luck. He actually dropped me 200 metres south of the fruit stall, this guy standing along the road won't scare so older people and I won't be affecting his sales. It was okay for me and I sat down on the road, put on some sunscreen and waited. It took thirty minutes before a car appeared and also pulled over to give me a ride. In the car was the 35-year-old club bouncer and chef cook from Halls Creek, Garrett, quite a muscular type too, who was on his way to his annual parents visit in Port Hedland, some 500km 'down the road'. Yep, that sounded good to me and I was his company for the coming 6 hours. I listened his entire music tape collection, he bought me a few drinks at roadhouses and we both counted road kill to stay alert (awake). We arrived in Port Hedland in the darkness (we were quite blinded by the setting sun) around 7pm. With me having no place to sleep for tonight, Garrett dropped me off at one of the backpackers motels in town and waited for me. Maybe I'd get in and maybe we had to try it at the next one. I thanked Garrett for the ride and the drop-off and loaded by gear in the dorm room. In the communal living room of the hostel, where I met up with a Dutch couple, some Germans and two gals from Perth, Sue asked if I had anything to eat for dinner and then shovelled a giant t-bone stake in my hands. "There you go!" 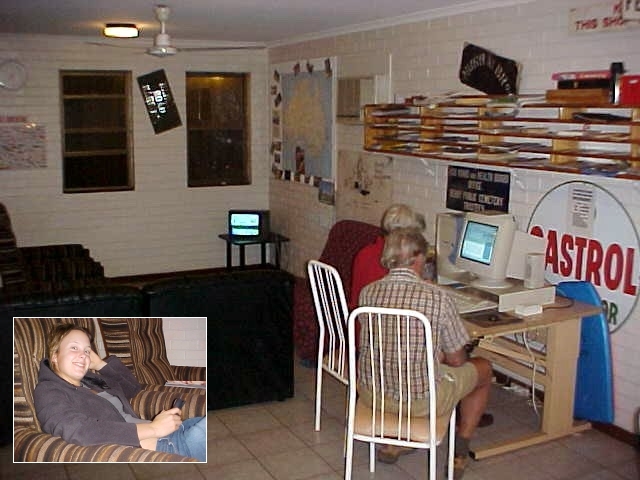 The night ended with me watching some television (long time ago!) together with the cute university students Jess and Phoebe from Perth, who were rather enjoyable company. The ladies were on their holiday break and on their way to Broome. They flew from Perth to Port Hedland today, because a ticket to Broome right away was so much more expensive. Tomorrow they'd hitchhike towards Broome. Jess just could not believe my way of travelling and was totally excited for a few hours. Even in the dorm room we all shared, the talks about life, travelling and whatever came up, continued into the depths of the night, very inspiring too. And maybe it was because I had not spoken with my-age folks in a long time that I felt very comfy with them. Jess even gave me a back massage! How pleasing that was! And another passed by. A day where I would not know where I'd be ending later the day and not knowing if there would be some help in food at that place, but where all the pieces of the puzzle seemed to fit at the right spot anyhow. I think I am very lucky!